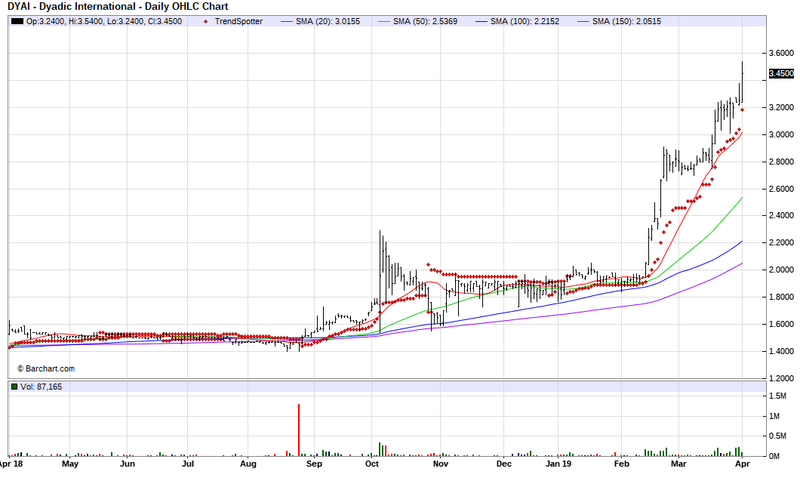 The Barchart Chart of the Day belongs to the genomics company Dyadic International (OTCQX:DYAI). I found the stock by using the Barchart screener to screen OTC stocks with Weighted Alphas of 34.00+ and technical buy signals of 80% or more. I then sorted by the highest technical buy signals and used the Flipchart function to review the chart for consistent price appreciation in the last year. Since the Trend Spotter signaled a buy on 1/9 the stock gained 75.13%. Dyadic International, Inc. is a leading genomics company with the groundbreaking technology that brings nature to the marketplace. Dyadic is poised to become a global leader in proteomics through the discovery, development, and manufacturing of novel products derived from the DNA of complex living organisms including humans found in the earth's biodiversity. Using its integrated technology platform, Dyadic develops biological products such as proteins, enzymes, polypeptides and small molecules for applications in large segments of the agricultural, industrial, chemical and biopharmaceutical industries. By utilizing a proprietary host organism, Dyadic's `one-stop shop` technology rapidly discovers and expresses eukaryotic genes the genes of complex living organisms and then manufactures those unique biological products for commercial application. Dyadic's systems overcome the inadequacy of existing gene discovery and product development techniques.